Contract Configurator - A config-file based solution for creating new contracts! Contract Summary - This contains all the summary text, expiry/deadline dates, and reward information. Parameters - These are mappings to the stock ContractParameter classes which specify what the player has to do to complete the contract. Requirements - This is what is required before the contract will show up. Most of the ProgressTracking information is supported, along with a few other things. Behaviours - These are behaviours that are applied at the contract level. A behaviour can create additional objects related to the contract (such as spawning Kerbals), be used to store persistent data or any number of other things. Data nodes - These define new data for use within the contract using Contract Configurator's powerful expression language. And if the provided parameters and requirements aren't enough, Contract Configurator is extensible. New parameters and requirements can be added in as little as a dozen lines of code. Contract Configurator can be downloaded from GitHub. The full source and test configuration is available on GitHub. The user guide is hosted on the GitHub wiki. Improved performance of WaypointGenerator's RANDOM_WAYPOINT_NEAR when the min/max distances are very close to each other. Fixed issue where too many waypoints can get generated by WaypointGenerator when count > 1. Renable backwards compatibility to KSP 1.4.5. Added actual and vacuum delta-vee to ReachState. Added LAUNCH_SITE sub-node to WaypointGenerator behaviour. Added support for LaunchSite class in expressions. Added OtherKerbinBiomes() function to return biomes like Baikerbanur biomes. Fixed Biome functions to correctly distinguish between KSC biomes and other collider based biomes. Fixed issue with sub-parameters sometimes showing as met when they shouldn't. Clarified error message when SpawnPassengers is omitted from a contract that requires it. Updated to work with RemoteTech 1.8.13+ (thanks PiezPiedPy). Added trig functions to expression language (thanks VaPal). Invalid Celestial Bodies constants no longer throw an error on parsing (improves overall support for planet packs that remove/rename planets). Fixed a bug that prevented casting from string to ExperienceTrait. Fixed an issue affecting CollectScience and biomes with spaces (thanks mpharoah). Kerbal.ExperienceTrait now returns an ExperienceTrait instead of a localised string. Increased max active contract multiplier slider maximum from 2.0 to 8.0. Support for RemoteTech 1.8.10.3 (thanks wraithan). Properly work around stock bug. Proper fix for last release (thanks Warezcrawler). Workaround for stock bug #18267 (contract parameters creating extra messages on completion). Re-enabled RemoteTech and Kerbal Konstructs integration for KSP 1.4.x. Fix error message when despawning spawned Kerbals (thanks steve_v). Added a warning message when validation errors prevent a DATA_EXPAND node from being parsed (thanks gyf1214). Fixed NRE when checking progress nodes (thanks DocMop). Fixed issue with duplicate assembly warning showing up when it shouldn't (thanks Gordon Dry). Fixed some issues with handling of newlines in config nodes (thanks inigma). Use case insensitive string comparison when loading celestial bodies in saved expressions (thanks gyf214). Added back MODULE checks in simple version of PartValidation (thanks chrisl). Support RemoteTech 1.8.9 (thanks vader111). Read date/time information from dateTimeFormatter (thanks Aelfhe1m). Improved display of HasAntenna parameter ratings (thanks Kerbas-ad-astra). Fixed logic for determining contract prestige (thanks sopindm). Fixed previously unlocked parts being re-locked if player tries to buy a science node they don't have sufficient funds for (thanks inigma). Fixed issue using DATA_EXPAND with values that had special characters in them. Fixes interop issues between CatEye and Other Worlds Planet pack (thanks Chemox). Clarified wording of ActiveVesselRangeRequirement for RemoteTech (thanks Alshain). Added check for old usage of partModuleType=Power (thanks muppet9876). Prevent Rendezvous parameter from completing when doing an EVA (thanks pap1723). Don't allow main menu to continue while still loading (prevents issues on slower systems). Made RemoteTech distance function (for coverage system) more generous (thanks NathanKell). Fixed issue with Kerbals spawned at KSC starting an extra ~60 meters in the air (thanks Keniamin). Fixed error when cancelling a contract with spawned Kerbals. Fixed exception with FlyBy and ReturnFromFlyBy requirements. Properly fixed Facility requirement in the tracking station (thanks Kerbas_ad_astra). Fixed NRE from struts breaking (thanks Alshain). Fixed multiple exceptions when using Sigma Binary (thanks Rodger). Fixed major bug with VisitWaypoint not properly setting waypoint distances (thanks Keniamin and others). Fixed issue with FacilityRequirement in tracking station (thanks JPLRepo). Fixed issue where some requirement details weren't being saved in contracts. Fixed localisation issue with character names in dialog boxes. Fixed exception when pressing orbit buttons in tracking station (thanks doktorstick). Fix issue with contract item sizes not always being set correctly in mission control when switching tabs. Fixed "input is null" error in Docking parameter (thanks linuxgurugamer). Fixed to not generate contracts without parameters (thanks severedsolo). Fixed Sigma Dimensions compatibility issue with atmosphere height (thanks pap1723 and Sigma88). Fix argumentOfPeriapsis issue (thanks Intrepidrd). Fixed issue with vessel identifier parsing introduced in 1.22.0 (thanks Li0n). Added HasAntenna parameter (thanks Kerbas-ad-astra). Added Vessel.AntennaTransmitPower() and Vesse.AntennaRelayPower() (thanks Kerbas-ad-astra). Contract weights for celestial bodies are now set by Contract Configurator (affecting the likelihood of stock contracts generating for the given body). Added minArgumentOfPeriapsis and maxArgumentOfPeriapsis to Orbit parameter. Make references to 'Sun' generic in SolarScience.cfg to fix Galileo compatibility (thanks SirBriguy). Added Sun() function to get the Sun in a non-name specific way. Assumes a single star. Change enum parsing to be case insensitive. Change Vessel Identifier parsing to allow a wider range of characters. Fixed format text for funding message in mission control (thanks JPLRepo). Fixed issue with NextUnreachedBody() call caching results (thanks severedsolo). Found new workaround for GetExportedTypes reflection issue (the "toolbar" issue). Added NextUnreachedBody() and NextUnreachedBodies() methods. Added Part.MassDry() and Part.MassWet() methods. Fixed contract window text not updating for dynamic text (duration timers, etc.). Regenerate biome data for KSP 1.2 biomes (fixes Field Research "Rare Science" contracts, thanks FlatEric). Added RemoteTech integration back in. Fixed issue with nested contract groups not working (thanks jeisen). Allow contract title in mission control to span two lines. Moved settings into stock settings screen. Fixed NRE when vessel's Landed At string is null (thanks SamLex). Check for sufficient funds when there are negative contract advances (thanks 5thHorseman). Fixed display issue with partially complete CollectScience parameters. Reworked ParameterDelegate - worst source of in-flight LINQ (ie. garbage). Check contract requirements before displaying them in mission control in case something has changed. Fixed issues with part parser (thanks 5thHorseman). Fixed exception in Mission Control (thanks Conventia & AccidentalDisassembly). Fixed a NullReferenceException in PartValidation. Fixed an incorrect condition on the ReseachBodies check which caused heaps of garbage to be created (thanks xEvilReeperx). Fixed issue with Duration parameter not kicking off correctly in some circumstances (thanks 5thHorseman). Fixed NRE on contract save (thanks CecilFF4). New Base and ISRU agent icons from Enceos. Added partModule and partModuleType to TechResearchedRequirement. Fixed problem with requirement data for offered data not getting fixed until contract save (thanks severedsolo). Fixed sorting of contract groups (thanks pap1723). Fixed Resource parsing limitations (thanks hargn). Fixed issue with DATA nodes and child contract groups (thanks hargn). Disallow DMOS Seismic Impact Hammer at KSC in science subsystem (thanks BeafSalad). Remove short-circuit in Any/All requirement texts for players aren't given incorrect information (thanks inigma). Fixed an issue that prevented expressions from working in resource loading (thanks hargn). Cycle through new contracts to generate in a random order to prevent certain contracts from getting preference. Fixed issue where contract expiries were never getting set (thanks DarkonZ). Fixed issue with some parameters combined with the All parameter causing incorrect contract failure (thanks tomf). Fixed issue with selected contract in mission control getting unselected when a new contract is generated (thanks AccidentalDisassembly). Mission Control remembers the last visited tab when you open it, and takes you there. Added Tracking Station buttons for filtering orbits/waypoints from contracts. Added support for adding loading tool tips. Better support for Kolniya/Tundra orbits - will error if the orbit would exit the SOI. Also added CelestialBody methods to determine if the body is allowed to have Kolniya/Tundra orbits. Fix for contracts not being offered on a brand new save until at least one stock contract is offered (thanks to all the RP-0 users who reported this). Fixed issue where parameter completion data wasn't correctly copied to newly created vessel on undock/decouple (thanks linuxgurugamer). Fixed issue with using Enter button to go to Mission Control (thanks Deimos Rast). Fixed agent for stock satellite contracts. Fixed issue with sortKey in child contract groups (thanks pap1723). Silence Research Bodies error (thanks Liondrome). Fixed problems with ResearchBodies support (it was offering some contracts that it shouldn't have). Support for ResearchBodies - contracts won't be offered until the appropriate body has been researched (thanks JPLRepo). Integrated support for Kerbal Konstructs directly into Contract Configurator. Agent data for stock contracts is now defined in a cfg file, instead of hardcoded (see CONTRACT_DEFINITION in documentation). Properly factor in autoAccept contracts when deciding whether to enable the accept button in Mission Control (thanks ETM, Nightside & Aelfhe1m). Fixed issue with contract generation process starting up before the stock contract system was done loading. This would cause contracts to be offered that weren't supposed to be offered, which could cause other issues (like a contract that can be accepted but is then removed, or an active contract that gets removed unexpectedly). Thanks to everyone who's been very patient on this nasty & hard to track down bug. Fixed contracts that didn't properly expire once the expiry date hit. Increased default expiry dates (since long expiries no longer prevent other contracts from generating). Updated agent icons from Enceos. Fixed issue introduced in 1.15.x with Prestige() function that incorrectly treated all contracts as Trivial. Fixed issue with text for Funds/Science/Reputation requirements. Fixed issue with sorting in Available tab of Mission Control. Fixed exception when declining/cancelling contracts in Mission Control. Increased contract limits based on building level. Increased contract limits even more based on building level. Fixed issue where contract limits could be exceeded in the Available tab of Mission Control (thanks severedsolo). Fixed possible exception in HasCrew (thanks cpottinger). Fixed issue with "ghost" contracts showing up as offered (thanks vardicd & severedsolo). Fixed issue with MaxTechLevelUnlocked function (thanks hargn). New Mission Control layout. Now all contracts that are eligible are available all the time (players are no longer at the mercy of the RNG to get the contracts they want). Also, can view the details of what contracts are *not yet* available, and what it takes to make them available. New contract art (special thanks to Enceos)! Contract generation overhaul. Overhaul to the contract generation system for massive performance improvements. Contracts are no longer generated in-flight (no garbage, no stutters). Added title and related attributes for REQUIREMENT nodes. Added title and related attributes for DATA nodes. Added sortKey for CONTRACT_TYPE and CONTRACT_GROUP nodes. New List.SelectUnique() method for selecting unique values (replaces selecting a random value and hoping that it hasn't been used before). New DATA_EXPAND node allows a CONTRACT_TYPE to be duplicated across a list of values (eg. duplicated for each Celestial Body). New CelestialBody.Index() method to get the global index of a body (for sorting). More warnings to steer contract authors towards more performant and more player-friendly ways of writing contracts. Fixed issue where the state of some parameters wasn't immediately reset when switching vessels, allowing erroneous contract completion (thanks NathanKell & leudaimon). Fixed bug in uniqueness checks when vessels are involved which caused the uniquness check not to work (thanks severedsolo). Fixed issue where CollectScience parameters weren't always showing the checkmarks when partially completed (thanks jlcarneiro & severedsolo). Added suppport for partModuleType in PartValidation. Added AtMost and AtLeast set requirements. Fixed issue where HasCrew was counting tourists. Fixed issue where partModuleType = Wheel wasn't picking up the LY-01 fixed landing gear (or any wheel part without a motor). Fixed issue with VisitWaypoing and WaypointGenerator not correctly update waypoint names when expressions are used. Reduced LINQ and reflection calls in expression parser for performance/garbage collection improvements. Integrated Wider Contracts App into Contract Configurator. Fixed isuse with SpawnVessels spawning vessels with incorrect rotation (thanks severedsolo). Prevent Rendenzvous parameter from triggering when a vessel performs a rendezvous with itself (thanks danielguo). Fixed NRE on contract accept when using SpawnVessel's craftPart method of spawning. Fixed PartModuleUnlocked and PartUnlocked requirements to check for part purchase and not just tech unlock (thanks inigma). Always set the CollectScience targetBody to the one from the biome if a biome is used (thanks severedsolo & enceos). Fixed exception in RecoverKerbal (thanks palleon). Fixed incorrect handling of waypoints with negative altitude on non-ocean worlds in VisitWaypoint (thanks Galenmacil). Removed extra ConfiguredContract entries from settings menu (thanks Deimos Rast). Fixed backwards compatibility for Wheel PartModuleType (thanks TheReadPanda). Added support for NextKerbalHireCost() expression function. Fixed exception in the Expression behaviour (thanks severedsolo). Fixed deriving primary situation for biomes with a space in the name. Fixed exception in science util functions (thanks Chippy the Space Dog). Fixed exception when docking (thanks Lennartos and others). Fixed logic for setting contract weights that was broken by 1.1.x changes (thanks severedsolo). Removed some broken validation (thanks linuxgurugamer). Fixed exception when removing certain contract packs (thanks rasta013). Fixed edge case where AwardExperience was late awarding the experience (thanks severedsolo). Fixed exception with Contracts Window + (thanks sidfu). Improved accuracy of VesselNotDestroyed checks (thanks inigma). Fixed bug in barycenter logic when using Sigma Binary (thanks sentania). Improved backwards compatibility with contract packs using the old Wheel module name (thanks galenmacil). Re-generate PQS offset coordinates when flight begins (workaround for Kopernicus waypoint offset issue). Fixed exception when recovering vessel (thanks BluK). Clean up some "Input is null" errors/warnings. Remove support for ancient versions of Module Manager. Revert additional check added in 1.11.0 that broke PartModuleTypeUnlocked (thanks KnotaiG). Work around upgrade issue with ReachSpecificOrbit (thansk Tossy64). Possible fix to PartModuleUnlockedRequirement (thanks AccidentalDisassembly). Fixed exception when generating autoAccept contracts. Update to KSP 1.1.1 (release to make CKAN happy). Compile to latest *dev* RemoteTech. Performance fixes and improved caching of biome data. Duration values can now be used in arithmetic and comparisons in expressions. Fixed issue with vessel re-assignment on undock (thanks chrisl). Improved contract window text when tracking vessels in a VesselParameterGroup. Improved API for requirement saving/loading. Add proper error handling to PartModuleTypeUnlocked. Added ReachSpecificOrbit.displayNotes back in (thanks severedsolo). Fixed so orbits for offered contract show up in the tracking station and NOT in flight. Fixed RemoteTech exceptions (thanks HaArLiNsH, Dtgnoome and Sidelia). Fixed contract "flickering" on RemoteTech contracts (thanks Razorfang). Fixed problems with SCANsat contracts (thanks Torih). Fixed issues with child requirements not getting properly propagated to offered contracts. Fixed disabling of contract requirements in debug menu (the contract would appear then immediately disappear). Fixed exception on requirement load of SCANsatLocationCoverage (thanks wizisi2k). Properly fixed contract "flickering" in mission control. Fixed exception on requirement load of FundsRequirement (thanks EldrinFal). Contract requirements are now saved to persistence file (fixes issues with "flickering" contracts in mission control). Added VesselValidRequirement to check if a vessel identifier is valid throughout the life of a contract. Added support for PQSCity in expressions. Fixed backwards compatibility on uniqueness checks (thanks eberkain). Fixed edge case for VesselParameterGroup and completeInSequence (thanks NathanKell and stratochief). Fixed problem with loading pqsCity and targetBody out of order in WaypointGenerator (thanks severedsolo). Waypoint Manager - this will help with any contract using the stock waypoint system by drawing the waypoints in the flight view. Makes hitting targets more accurately much easier! Contract Configurator is licensed under the MIT License. 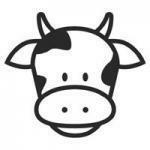 RemoteTech integration (CC_RemoteTech.dll) is licensed under GNU GPL v2.0. Like what you see? Consider donating to the coffee fund! It will not go directly to supporting this or other mods under my care, but it may keep my motivation up! Thi﻿s is a list of all mods that provide contracts packs built on Contract Configurator. If you have something you'd like added to this list, PM ﻿me or post in this thread. Anomaly Surveyor @nightingale- Contracts to go search out the various Easter eggs that are included in KSP. Field Research @nightingale- Contracts to do science! Receive contracts for performing a variety of experiments under different situations. Use it to drive the science in your space program, or use it to collect every last bit of science. Giving Aircraft a Purpose (GAP) @inigma- Gives a great variety of contracts for Kerbin, including Aerospace Exploration, Coast Guard Rescue, and General Operations. History of Spaceflight @Frylovespi - Contains 670 contracts for RSS/RP-0 and 622 contracts for Stock. It contains every mission from the time frames 1942-1967, basically the first 25 years of spaceflight. 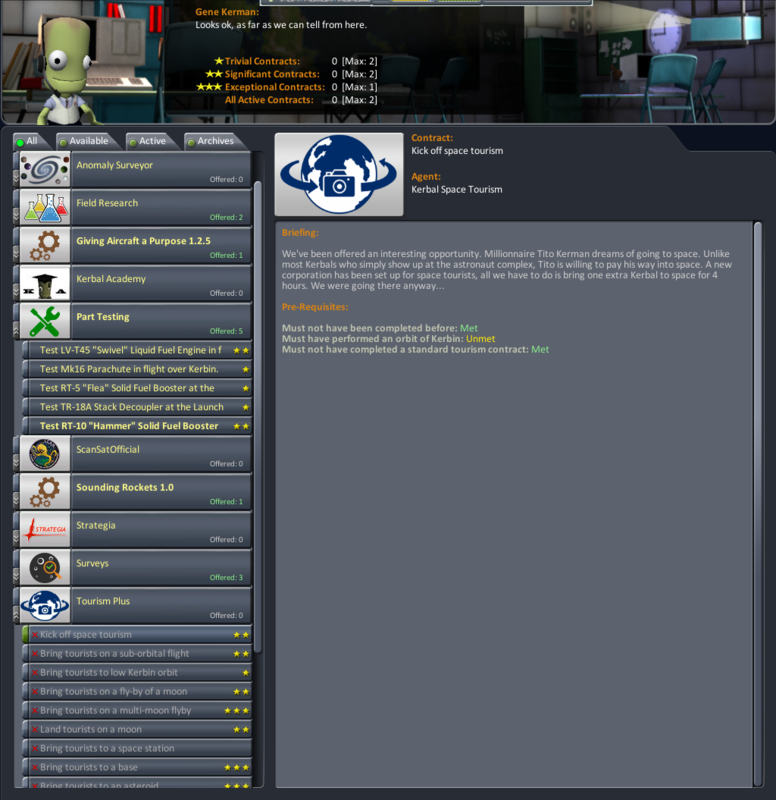 Kerbal Academy @Mark Kerbin - Paid contracts to train up your Kerbals to get them more experience. RemoteTech Contract Pack @nightingale - Contracts for setting up RemoteTech satellite networks and providing coverage to planets/moons. Sounding Rockets @inigma - Companion contracts to go with the USI Sounding Rockets! Tourism Plus @nightingale- Better tourism! A richer tourism experience than stock. Take tourists to space and to visit the stations and bases that you've already created. Build new tourist attractions like the space casino mega-project. Additional Progression Contracts @tjsnh- Contains a series of missions intended to add some more direction and depth to career mode. Kerbin Bases and Stations @LemonSkin - Build a space station in Kerbin orbit over several contracts. Once it's up, get contracts to upgrade and maintain your station. Kerbin Side GAP @Keniamin - Inspired by GAP and Kerbin-SideJobs, provides contracts for air shuttles between various Kerbin-Side bases. SETI-Contracts @Yemo - The SETI-Contracts offer a rebalanced contract progression designed for unmanned starts, though they work with tech trees offering manned starts as well, like the stock tech tree. AntennaRange Relays @Kerbas_ad_astra - Get money for setting up AntennaRange relays! Defence Contract Advisors @Tazius - A BDArmory military contract pack. Historical Progression @pap1723 - A contract pack that takes you through the history of human spaceflight. Career Evolution Contract Pack @pap1723 - A Contract Pack starts from uncrewed launches like sounding rockets, to the first satellite into crewed launches that explore the solar system. Interplanetary Mountaineer @Syntax- Contracts to visit the high/low points throughout the solar system. Grand Tours @linuxgurugamer - A series of 12 grand tours of the Kerbal System. Contract packs that have fallen out of support or simply don't work in newer versions of KSP/Contract Configurator. 5dim Military @odin_spain - Some changes to how vessels spawn in Contract Configurator broke the spawning in this contract pack, and odin_spain seems to have disappeared. SCANsat Lite @severedsolo- This contract pack has been integrated into SCANsat itself. Sprite Missions @linuxgurugamer- Sadly the sprite doesn't work in 1.x aero, so this contract pack is no longer supported. All add-ons that are posted on the services maintained by Squad that serve the KSP Community (such as this forum and Curse) must be accompanied by a license that regulates what other users can do with the copyrighted material. This license must be made available in both the download file and in the location the user downloads from (such as a forum post or a Curse listing). If the contract pack modifies, enhances or uses another mod, be respectful of the licenses of those mods. If the maintainer of a mod used by a contract pack requests that a contract pack be removed or modified, please work with them to make the Contract Pack comply with their wishes and vision for their mod. Remember that the contract pack wouldn't be possible without the original author's mod. I, nightingale, have the final say on what is listed. I do not generally want to be the one telling people what they can and cannot do, so I will list most contract packs so long as the comply with the above two rules. Have your contract pack install into a subdirectory under GameData/ContractPacks/. Contract Configurator does not require this directory structure, but this keeps it cleaner for the end user. If adding your contract pack on CKAN, a name of the form "Contract Pack: <name of contract pack>" is recommended. This keeps the listings of all contract packs together, and allows the player to easily compare and decide which contract packs they are interested in. Try to be original. If your contract pack has significant overlap with an existing contract pack, consider contacting the author and working with them to enhance the contract pack. Be creative! The possibilities for contract packs are endless. Another mod to make modders' lifes easier! That's how I like it! Thanks for your effort, Nightingale. That's a great work, and I'm looking forward to it! Your doing the work of the gods. This will lead to a whole lot of contract mods and that is a good thing. Would it be possible to add something that can disable the standard contracts, so that if you make for example a pack of contracts that resemble the Space Race, you won't have the stock contracts messing up the contracts menu. that's what Squad should have done in the first place, quite a shame for them and a big thanks to you ! Is it possible to add two things? First, VesselSpawner - which would spawn a ship at specified orbit, just like Kerbals from rescue contracts (I'm not talking about surface spawn now, just orbit). The vessel itself comes from Ships folder (i.e. it's possible to spawn, say, Aeris 3 at LKO, or any of your designs, or a design which comes with contract pack). It cannot be controlled until docked with. Second, completion (or failure) of another contract as a requirement of spawning of the next contract. You can see why it's needed - with it, it would be possible to set up a full-blown, non-linear, story-driven campaign. While we're asking things, the one thing I saw lacking in that is the ReturnFrom parameter. It also would be nice to have some generic parameters, like HasCrew, HasPower, etc. Requirements for specific resources can ape a duration requirement (ie must have at least 5 Oxygen onboard"). With the original mission controller mod we could write contracts that would chain requirements. That made storytelling possible. Go here then go there ... rather than Squad's dwarf-fortress approach allowing only procedurally generated contracts. Oooh, duration is a great idea. I'd like a contract, saying "We want you to do a thing"
Thanks all for the really positive feedback. I'm happy that my first mod has been so well received! Once I get that going, the I don't think ship version shouldn't be a huge jump. // Requirement for having a certain number of contracts completed of the given type. // type or a standard contract type (class). // the requirement is met. // requirement will no longer be met. I'll maybe enhance this (or create a different one) to allow for requiring that a contract be failed. You correctly guessed where I'm going with this - the mod that I wanted to build was one that had a tree of progression based one-time contracts, but I realized they didn't fit nicely in with the way the Squad contract system works. Most of my goals around ContractConfigurator are to set the stage for this future mod. Yup, definitely plans for building a mod using ContractConfigurator. I'd considered for that mod that I might disable the stock contracts (or some of them), but decided to just leave it. Since there's interest I'll look into ways to disable contracts via ContractConfigurator configuration - it looks like the list of valid contract types is public in the Squad code, so I should be able to modify it (just need to figure out the right time to do it). For the first release I didn't write any parameters - just wrappers to the stock ones. The next major goal will be supporting Fine Print parameters (since they will be stock soon enough anyway). After that I'll looks at interesting/generic parameters/requirements. The ones you've mentioned all seem reasonable, I'll add them to the backlog. As to your alternate suggestion I'd also like to be able to make this fit in with resource/mining mods - so Parameters like "have x amount of resource y" on a vessel are definitely in the pipeline. So in the end I'll probably implement both of these suggestions. And that's the exact type of mod I'd like to make easy for people to write. "Now, as you've surely deduced already from all this, this is why we're here". Do you mean modify the amount of research from other contracts (ie. stock ones)? I'll be honest, that's starting to get outside the intended scope of ContractConfigurator (which is providing an easy option for creating new contracts). Or did I misunderstand your request? Yeah, as an old Mission Controller dev I recognized the approach straight away (so is Sandworm, so that's not surprising. ). ReturnFrom is a stock Param, though, I thought? The other stuff not so much...I would highly suggest waiting a bit for dealing with FP, as we don't know how much has changed for 0.90. I've just look at the archive, why not adding the 2nd post content inside ? (License didn't help that's much ). I've got a couple of my old mission packs for lying around. But they all involve duration and/or resource requirements. I did a bunch to simulate the realities if interplanetary flight. A sub-mission requirement such as ((in orbit = Sun) and (liquidfuel = 0) for (time=50 days)) forces the player to rely on xenon or monoprop, simulating the reality of boiloff without getting into realfuels-type plugins. Testing missions would also benefit from a duration requirement. Run a test between 10k and 12k is easy. Staying between 10k and 12k for 5 minutes is a much much harder task. ReturnFrom is a stock Param, though, I thought? It's an achievement - KSPAchievements.ReturnFrom (Flight | FlyBy | Orbit | SubOrbit | Surface). A lot of the achievements seem to have a mirrored ContractParameter, but not this one. But given that there's an achievement, that means that there's the right hooks to make writing a parameter for it pretty easy (I hope). I would highly suggest waiting a bit for dealing with FP, as we don't know how much has changed for 0.90. That's probably good advice. Some of the FP parameters are so perfect in their simplicity that I can see them changing (ie. PartNameParameter - it's simply "have part x on the vessel"), but others may not fit well in current stock KSP (ie. ResourceExtractionParameter - there's currently no way to extract resources in stock). At the same time, there's stuff like ResourcePossessionParameter - which exactly matches up with the parameter that Sandworm suggested. I guess it depends on how hard it is - writing a ParameterFactory wrapper can be as quick as 5-10 minutes - and that's for the Squad ones where I have to make some guesses based on methods/members - having full access to the code makes the FP ones *easy*. Arsonide, I'm sure you're under NDA, but if the FP parameters are going into stock relatively untouched, please cough or blink twice. I know there's a mod (ZeroScienceContracts) which zeros out science for people who think science from contracts is cheaty. I know the question is a bit out-of-scope, but in the process of writing the mod, have you found a way to get a reference to each contract as it is offered? I'm trying to do blanket editing of contracts, and what ZeroScience does won't work for me*. *ZeroScience zeroes out the science on all contracts each time the list changes, whereas what I'm doing needs to be a one-time multiplier of funds. I've tried adding a dummy parameter to mark ones I've already visited, and it caused odd behavior with the scripted contracts: I think the parameter list is part of how KSP recognizes those scripted contracts. I just wanted to keep the first post clean/short (it'll grow with the changelog). Also keeping the "documentation" in one post seemed sensible. If I wasn't convinced before, I am now. Expect the Duration parameter in the next release. Nope, haven't found a way - mainly since I wasn't looking for it. ContractConfigurator works by having a single new Contract sub-class "ConfiguredContract". All contracts specified in the config file are of that class - the additional information is mostly captured in the ContractType class. You're right though - the contract system does interesting things with parameters - when I was testing a contract with no parameters it caused an exception in a sorting method. Presumably, something about parameters (I have no idea what) affects how they are sorted in the window. Thanks for the help: the dictionary idea is promising. GetHashString() won't work: it keeps on changing when the scene changes. More testing is required, but I think Contract.ContractID is going to work better. EDIT: Contract.ContractID does seem to be unique, and persistent between reloading the game. Now to figure out where to steal some code for keeping a dictionary persistent for a save game, probably from KAC.